The essence of the 2030 Agenda for Sustainable Development is recognition that the welfare of a country encompasses much more than just expansion of economic output. The 2030 Agenda is aimed at promoting a broader concept of well-being through emphasis on social inclusiveness and environmental sustainability. However, while assessing economic conditions and growth prospects is necessary, it certainly is not sufficient to do justice to the spirit of the 2030 Agenda. In this context, although the Economic and Social Survey of Asia and the Pacific 2017 contained an examination of economic conditions in the Asia-Pacific region, its findings also highlighted that the benefits of economic expansion have accrued less to the poor, that inequality is high and that environmental degradation needs to be checked. To improve the quality of economic growth, comprehensive measures are needed, including labour market policies on such issues as minimum wages, fiscal measures, such as progressive taxation and social assistance, and environment policy instruments, such as energy subsidy reform and carbon pricing. In the Survey for 2017, it was argued that effective pursuit of such a comprehensive policy agenda requires better and more effective governance, particularly in the context of fiscal management given the growing demands on fiscal policy to support economies and address diverse social and environmental challenges. In that publication, it was shown that good governance can help enhance the current low levels of tax revenues in several countries in the region and improve the composition and efficiency of public spending. The present report, the Year-end Update of the Survey for 2017, contains a further examination of the subject and analyses of the role of technology for better governance in fiscal management. In recognition of the sizeable financing gap between required and current investments in support of the Sustainable Development Goals, the Update also provides a preliminary assessment of means for strengthening public finances and effectively leveraging the private sector. 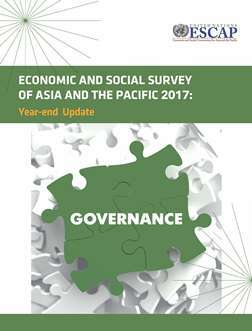 Before these issues are discussed, however, a detailed updated assessment of recent economic developments in Asia and the Pacific is provided as well as the various policy options that could improve economic, social and environmental prospects.